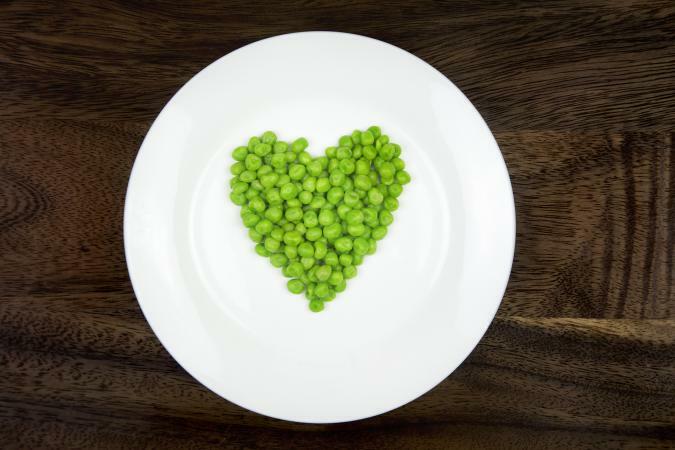 A starchy vegetable, peas offer the perfect blend of carbs, fiber, protein, vitamins, and minerals. That's why adding peas to your diet plan (especially in place of refined carbs) is the way to go. Green peas are higher in calories than non-starchy veggies (such as lettuce, cucumbers, peppers, celery and tomatoes). A 1-cup cooked portion of green peas contains about 134 calories. In comparison, 1 cup of lettuce provides between 4 and 10 calories per cup, and celery and cucumbers contain about 16 calories per cup. The same 1-cup cooked portion of green peas provides you with just over 8 grams of protein, 25 grams of carbohydrates, 9 grams of fiber, and less than 1 gram of dietary fat. Because peas are rich in protein and fiber, this starchy veggie helps keep you feeling full longer than other types of veggies. Green peas provide you with a whole host of vitamins and minerals, in addition to macronutrients. Peas, like other legumes, are a good source of dietary iron and zinc. They're also rich in phosphorous, potassium, magnesium, B vitamins (including folate), vitamin A, and vitamin K.
Chickpeas are similar in nutrition composition to green peas, but contain almost twice the calories and macronutrients. For example, 1 cup of cooked chickpeas provides you with 269 calories, 15 grams of protein, 4 grams of fat, 45 grams of carbs, and 13 grams of dietary fiber. As with green peas, chickpeas are a good source of iron, zinc, magnesium, phosphorous, potassium, B vitamins (including folate), vitamin A, and vitamin K. This veggie is also a source of calcium. Black-eyed peas, also known as cowpeas, are similar nutritionally to green peas. Black-eyed peas contain 160 calories in each cooked 1-cup portion and provide you with 5 grams of protein, 34 grams of carbs, and 8 grams of dietary fiber. These peas are also a source of calcium, iron, zinc, magnesium, phosphorous, potassium, B vitamins (including folate), vitamin A, and vitamin K.
As with other types of dried peas, split peas and pigeon peas provide you with protein, carbs, fiber, and a variety of vitamins and minerals. Split peas contain 231 calories in each 1-cup cooked portion, and pigeon peas provide you with 203 calories per cup. Peas, regardless of the type you choose, are good sources of vitamins, minerals, protein, carbs and fiber. The main difference between pea varieties is the amount calories and macronutrients each offers. Green peas are the lowest in calories (134 calories per cup) vs. chickpeas (269 calories).